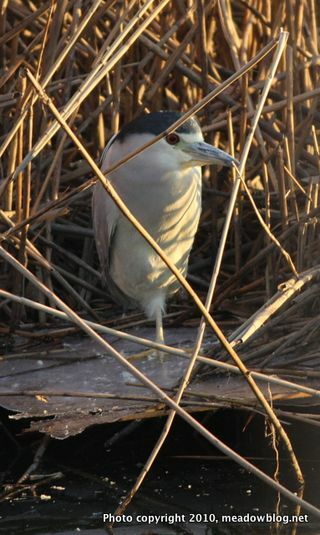 Chris Takacs and Dale Jankowski have seen Black-crowned Night Herons by the Marsh Discovery Trail in DeKorte Park — a nice winter find. These birds are considered a threatened species in New Jersey. Click here to learn more about their status and other threatened and endangered birds in NJ. We photographed this one today – tucked away with a buddy. The New Jersey Outdoors Blog had a nice post about looking for the Northern Shrike on Disposal Road, and how tough it can be to see it. We especially liked this line: "It's a shame the day was such a wash, but the Meadowlands is definitely one of the hidden gems of New Jersey."